2012 Volkswagen Polo R Line launched | What Car? 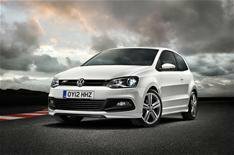 This is the Volkswagen Polo R Line; a sporty, high-spec addition to the VW Polo range. The deeper, sportier bumpers and side sill extensions give the Polo R Line a more muscular look. It also gets a gloss black radiator grille with R Line badging and 16-inch alloys. Darkened rear side windows and front foglights (with a static cornering function where they light up around corners) complete the makeover. Inside, the Polo R Line has aluminium door scuff plates, sports seats, leather steering wheel trim, aluminium pedal trim and black headlining. Standard equipment includes air-conditioning, electric windows (four- for five-door models), electrically operated and heated door mirrors and multi-device interface with USB input. Three- and five-door models are available. Just one engine is offered a 104bhp 1.2 TSI petrol. Average fuel economy is 53.3mpg and CO2 emissions are 124g/km. The VW Polo R Line is on sale now, at 15,195 for the 3dr and 15,815 for the 5dr. First deliveries are expected in July.